Want to scare the winter blahs from your flower beds? 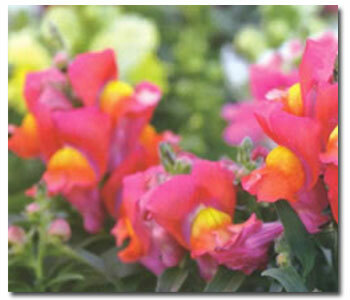 Pick up some colorful, cool season-loving snapdragons from your local nursery. A member of the foxglove family, ‘Antirrhinum’ is usually grown as an annual, but can perennialize in warmer climates. Wherever you are, snapdragons will provide a burst of bright color in the early spring garden. The upright flower spikes of snapdragons range in color from flaming red and vibrant pink to brilliant bronze and bright white. They are also available in a variety of sizes: a tall 2′-3′ variety is good for the back of the border, while shorter types brighten up bed fronts. Another variety, called ‘Magic Carpet,’ was developed especially for use in rock gardens. Whatever type you choose, be sure to give it lots of sun and fairly fertile, moist soil. On a final note: the biggest enemy of snapdragons isn’t a sword-wielding knight, it’s rust; check your plants often and be prepared to spray them with an organic fungicide at the first signs of disease.